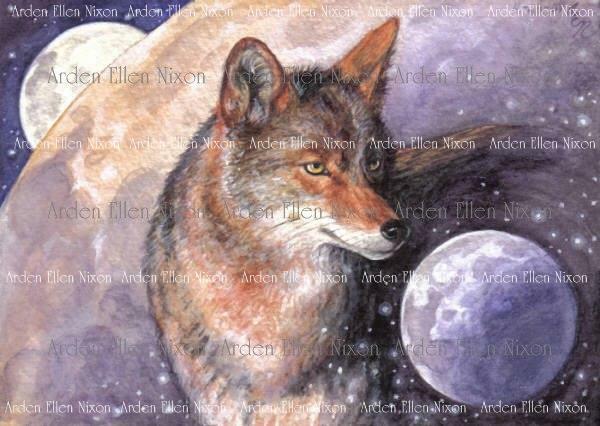 A friend commissioned me to paint a coyote for her husband and, with her permission, I designed him to fit into my long dormant Nature Tarot project. Artistically, I wish the center moon looked more, well, moon-ish, but I nit-pick my own work at the best of times. Coyote-wise, this is my first, of which I'm rather proud. The moon represents unceasing cycles of change and is sacred to a myriad of goddesses; one of them, Hecate, held canids as sacred. Coyotes are traditionally tricksters, and though he may succeed in hiding one moon, the cycle will continue on with or without his acquiescence. Even he is subject to the tides of creativity and fertility as guided by the lunar spheres. Three is a sacred number in many belief systems, and the meaning of the triplicate moon is truly in the eye of the beholder. In all honesty, I had sketched several circles and semi circles on the page to test the placement of one moon only to find myself drawn to the image of three overlapping.